Outfielders Derrick Robinson (front), Jason Bourgeois (right), and Wil Myers (back) have ups. Bourgeois broke up a no-hitter in the 4th and started an explosion of offense. Omaha won 8-5. WIL MYERS UPDATE: Myers went0-2 with a strikeout and a walk. He also scored a run. His batting average in Omaha is .455, and obviously will remain that high forever and ever, amen. A three-game sample is big enough, right? Omaha is now 27-16 and has an 8-game lead in the division. Game two is about to start, with Sean O’Sullivan making the start. 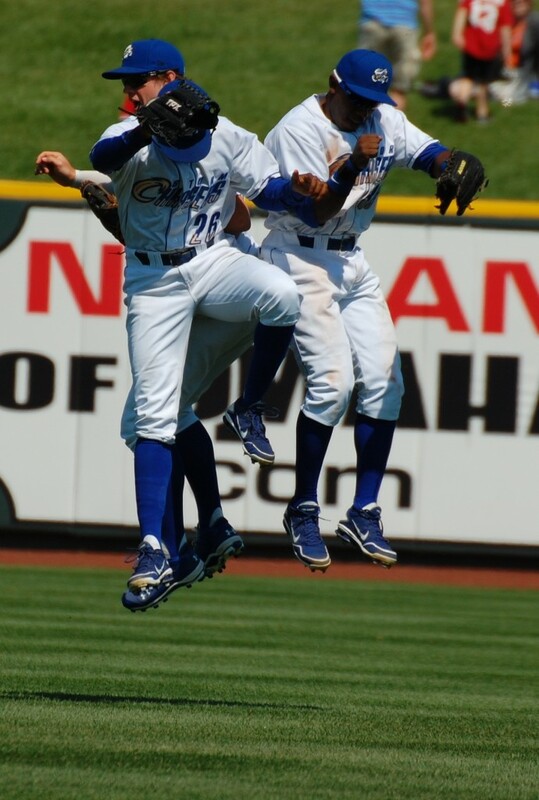 Photos from Saturday night’s Storm Chasers game.